India’s nemesis Mitchell Johnson, who tormented the Indian players both with bat and ball in the first three Test matches, has been ruled out of 4th and final Test in Sydney due to a hamstring injury. The news came as a big relief for Team India, which already lost the series 2-0 with one Test to go. 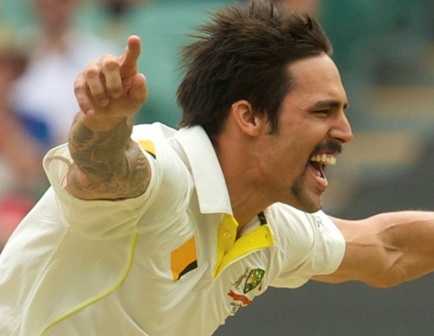 “Mitchell Johnson has been ruled out of the fourth Commonwealth Bank Test against India due to a hamstring injury he picked up during the third Test in Melbourne last week,” Cricket Australia said in a statement. Johnson has not yet fully recovered from the soreness in his right hamstring. He will be available for the ODI Tri-Series with India and England, which will start on January 16. The tri-series is very crucial from the 2015 World Cup preparations point of view. The WC will be hosted by Australia and New Zealand and will kick off next month. The Sydney Test will commence from January 6. Without Dhoni, India will seek to salvage the lost pride by securing a win in Sydney, which will be an herculean task.